Among the most important things a parent can do to ensure a happy and healthy future for their children is to instill a real commitment to oral health. Helping establish sound dental care practices today will pave the way for a lifetime of good habits. For that reason, it pays for parents to spend some time reviewing some key facts about the oral health needs of children. Fortunately, by following a few simple steps, keeping your children’s teeth and gums in great shape need not be a daunting prospect. 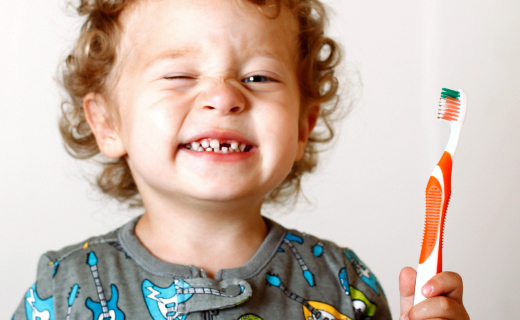 First, it is important for kids to brush their teeth two times a day with a toothpaste bearing the American Dental Association’s (ADA) seal of approval. This serves to remove plaque buildup that is a primary cause of dangerous tooth decay. Flossing each day is another critical step that helps remove food particles that can evolve into tartar that can be removed only by a dental care professional. Making sure to schedule routine appointments with your family dentistry practitioner for examinations and cleanings is another simple, yet essential part of maintaining optimal oral health. Parents can also encourage healthy eating habits that not only nourish the body, but also help keep the teeth and gums in prime condition. Limiting between-meal snacking and steering clear of excessive amounts of sugary and starchy food items is a great way to reduce plaque accumulation. With February being designated as National Children’s Dental Health Month (NCDHM), the oral health and habits of kids everywhere will be taking center stage. This initiative of the ADA is intended to provide children, parents, caregivers, and educators with valuable resources specifically designed to foster better dental care and stronger relationships with dental professionals. By offering promotional materials, informative classroom activity guides, and fun activity pages for children of all ages, the ADA hopes to increase awareness and bolster dental health on a national scale. Participating dentists who also choose to host Give Kids A Smile program events in their communities during the month of February will be making an extra contribution to the oral health of area youth in need. I really enjoy this dental office.